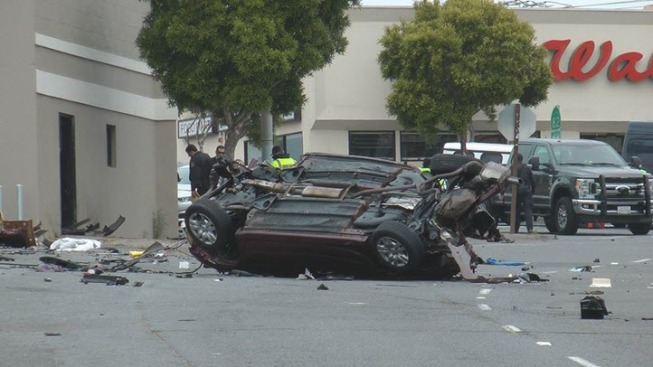 A motorist who sped down Mission Street near John Daly Boulevard in Daly City at excessive rates of speed died in a single-vehicle collision early Saturday, police said. A police officer tried to conduct a traffic stop on a speeding vehicle just before 4 a.m., Daly City police Sgt. Ron Harrison said. The vehicle didn't stop, but continued going southbound on Mission, Harrison said. Because the motorist was driving so fast, the officer didn't chase him, Harrison said. The officer found the vehicle shortly afterward in the 7400 block of Mission Street, where it had become involved in a collision, according to Harrison. The man who was driving the vehicle was pronounced dead at the scene, Harrison said. It's not certain what the vehicle hit, though there is a large center median the driver may have run into, according to Harrison. Police are investigating the incident and anyone with information is asked to contact Detective Patrick Dolan at 650-238-7962.